Pablo Picasso and Gertrude Stein. Few can be said to have had as broad an impact on European art in the twentieth century as these two cultural giants. Pablo Picasso, a pioneering visual artist, created a prolific and widely influential body of work. Gertrude Stein, an intellectual tastemaker, hosted the leading salon for artists and writers between the wars in her Paris apartment, welcoming Henri Matisse, Ernest Hemingway, and Ezra Pound to weekly events at her home to discuss art and literature. It comes as no surprise, then, that Picasso and Stein were fast friends and frequent confidantes. 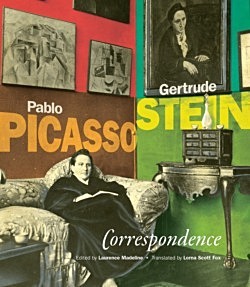 Through Picasso and Stein’s casual notes and reflective letters, this volume of correspondence between the two captures Paris both in the golden age of the early twentieth century and in one of its darkest hours, the Nazi occupation through mentions of dinner parties, lovers, work, and the crises of the two world wars. Illustrated with photographs and postcards, as well as drawings and paintings by Picasso, this collection captures an exhilarating period in European culture through the minds of two artistic greats.